HISTORY: Bob wanted to carve a blacksmith for years, but had resisted sculpting the conventional blacksmith nailing a shoe on a horse under the spreading chestnut tree. 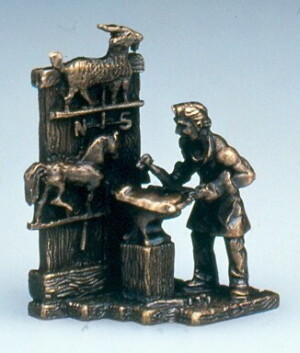 With the new techniques developed for the Rockwell Series, however, an artistic solution became clear to him. GENERAL: Armed with the new Rockwell technology, the studio can now tell a story in a different way, starting with the back wall and working forward. The weather vanes are historically accurate in their reproduction: the Lady Liberty on the back, a goat on top, the classic horse, and the pig being hammered out on the anvil. The weather vane on the rear of the upright is an "extra treat," comments Bob, because its inclusion did increase the carving time. Heavy texture in the wood of the background and the planked flooring was carved to contrast against the smoothness of the smithy's muscles and of the weather vanes. The back wall was set off to the left because of the natural, bronze-like darkness of the entire figurine. A "silhouette in the air" using the body of the smithy was planned. This is the same technique used in the American Frontier Series. "They are interesting to look at, because they cut their shapes in the air as a defined silhouette," explained Bob. The look is very Americana. There are new wooden bases for all figurines in the Americana Series. These are a thin slice of wood with the TMK and dates laser-cut into the bottom. They are not attached to the figurines, but are separate, and are designed to set off the series on display on a shelf. SIGNED: On the bottom of the bronze base.